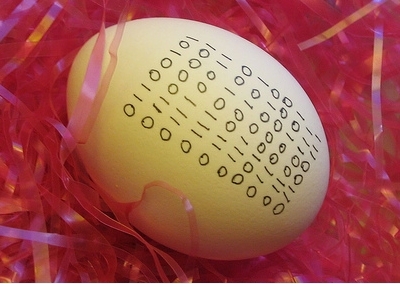 Happy (Geeky) Easter! | Wha’ever! Hope you’ll have a nice time, and don’t spend too much time thinking “what came first, hen or egg”, remember that keyboards don’t like chocolate as much as you do (they don’t like it at all actually), don’t forget to hug your loved ones over typing the latest blog update or checking on Easter tweets. They might think there is something wrong with you if you keep your face glued at your toys at all times, trust someone who knows. So enchant them at least occasionally with a glance, throwing in a “really?” or “how nice” or “didn’t think that really” into the discussions taking place around you. It is called smalltalk in the languages of the nineties. And then finally, be creative when it comes to painting eggs – one inspiration I posted here ;). Think these would also look good with little Apple signs fighting MS ones (and then Androids invading it all maybe? ), fail whales, facebook or RSS icons… You get the idea. But above all – have a GREAT time!! This entry was posted in Current Affairs and tagged Happy Easter by anmara. Bookmark the permalink.